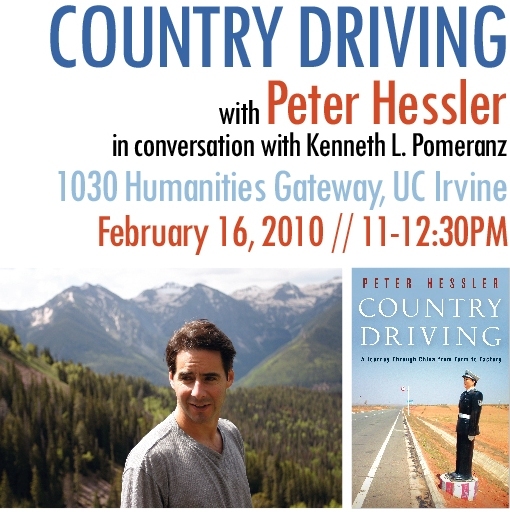 New Yorker writer Peter Hessler (author of the books River Town , Oracle Bones , and the about to be released Country Driving: A Journey Through China from Farm to Factory ) will be on campus February 16 to engage in a public dialog from 11-12:30 in Humanities Gateway 1030 with our own Ken Pomeranz, on where China’s been and might be heading. Hessler’s new book is an often funny as well as poignant look at how highways are changing the PRC, what it was like for the author to get to know the “last child” in a village, and about the factories of China’s “instant cities.” A more detailed description of the book is available on The China Beat blog. This entry was posted in events, writing and tagged Country Driving, Ken Pomeranz, Peter Hessler. Bookmark the permalink.